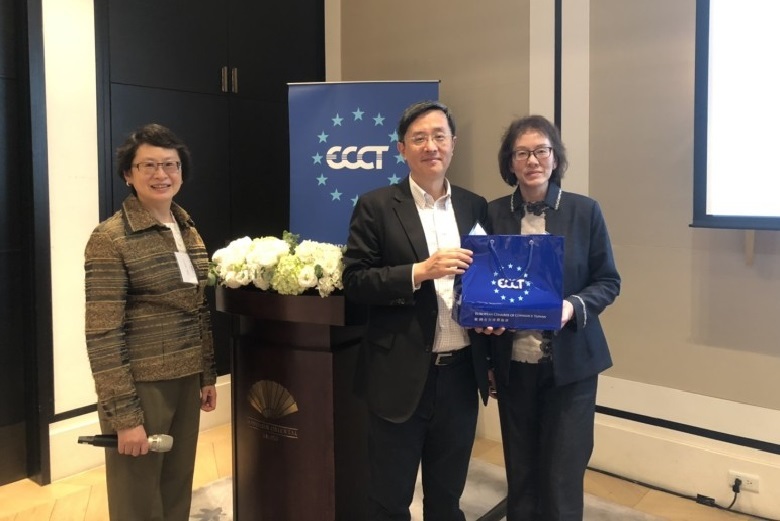 The ECCT's Tax committee hosted a lunch with Dr Roy Lee, Deputy Executive Director from the Taiwan WTO & RTA Centre at the Chung-Hua Institution for Economic Research (CIER) on the subject of the impact of US-China conflicts and Taiwan’s choices. The speaker began with a summary of global economic trends. Global GDP growth is losing momentum. Major drivers of growth, namely industrial production and retail sales growth and business confidence have been trending lower in recent months. CIER’s forecasts for Taiwan are consistent with this trend. According to Lee, domestic demand in 2018 had a higher than average contribution to GDP than in the previous 10 years compared to external demand, indicating the weakening capacity of trade to drive economic growth. Taiwan’s exports to most major markets (China, the EU and ASEAN) declined in November and December last year and Taiwan is not alone in experiencing sluggish trade. All major economies including the United States, China and Germany have seen declines in new manufacturing export orders this year. As an aside, Lee noted that Japan will be partially insulated from global economic factors this year and next given the extra stimulus to the economy from major events such as the emperor’s inauguration (in April this year) and the Rugby World Cup (later in 2019) and the Tokyo Olympics in 2020. However, Taiwan lacks these types of events that have international appeal. There are three primary factors contributing to the global economic slowdown: 1) the US-China economic conflict (which is no longer limited to trade); 2) China’s economic slow-down and 3) Structural changes in global supply chains. A recent report estimated that China’s real economic growth figures have historically been overstated by up to 1.7 percentage points, implying that growth in the most recent quarters was well under 5%. Regarding global supply chains, Lee referred to analysis which shows a reversal of the trend towards integration of global supply chains. According to this analysis, the level of integration rose rapidly from the year 2000 until it reached a peak in 2011. However, by 2015 the level of integration had fallen back to close to 2000 levels. Manufacturers are relying less on imported components thanks to technological changes, which sometimes make it cheaper to manufacture at home than to import. Other reasons that have led to this reversal include geopolitical and environmental factors. According to OECD estimates cited by Lee, in a worst-case scenario, the US-China conflict could cut China’s GDP by 1.4%, US GDP by over 1%, global GDP by 0.8% and global trade by close to 2%. However, a worst case scenario is not expected given recent signs of progress in US-China trade talks. For instance, China has agreed to reduce its trade deficit with the US (a key demand of the Trump administration) by buying more US agricultural goods (starting with an extra US$30 billion worth of corn, soy beans and wheat). Tentative progress has also been made in talks on structural reform issues such as the forced transfer of technologies, IPR protection, internet theft, services sector opening and non-tariff barriers. China has also said it would commit to stabilising its exchange rate and avoiding currency manipulation. The two sides are now talking about an enforcement mechanism, which may take the form of quarterly reviews, audits and an automatic sanction mechanism. However, no consensus has been reached in broader economic structural reform issues, such as reform of China’s state-owned enterprises (SOEs). Moreover, if automatic sanctions are put into effect based on the US’s assessment of China’s violations, it is not clear if China would retaliate in kind. Lee expects an initial agreement to freeze current tariffs and suspend plans to raise tariffs further. However, a second round of tariff wars is very likely further down the line. This is also the view of a number of analysts cited by Lee. The reason for this is that they predict that the two sides will disagree on the enforcement mechanism. According to Lee, a tariff war will likely be a catalyst for a broader conflict. In the short term, many measures can be used to offset tariffs (such as export tax rebates, VAT cuts and subsidies). However, these measures are not sustainable in the long term while they could have other impacts in the long-term. Xi Jin-ping’s calls for “Ensuring Six Stabilities” (ie employment, financial, trade, FDI, domestic investment and outlook) belie concerns about these very issues. Chinese authorities are increasingly concerned about FDI outflows and declining consumer confidence and that contingent measures are undermining fiscal capacities and further distorting allocation. The US-China technology conflict is even more challenging. It is not just about Huawei and 5G. However, it is also uncertain what the US administration’s intended scope and end-game is or how China will respond. This is a serious issue for Taiwan because Taiwanese firms have deep connections with both China and the US. While the US’s intentions are not completely clear, there are indications to consider. On 10 November 2018, the inter-agency Committee on Foreign Investment in the United States (CFIUS) began a pilot programme requiring certain procedures and mandatory reporting requirements for investments in certain technology sectors under the terms of the Foreign Investment Risk Review Modernization Act (FIRRMA), which was enacted by the US congress in 2018. This is a clear departure from previous practice, when the US did not monitor foreign investments. The US, France, Japan, Korea, Australia and Taiwan have already banned the use of Huawei products in their telecom networks and others (Germany, New Zealand, the UK, India and Norway) have tightened security requirements, which may severely restrict the use of the company’s products in practice. For now US-China tensions have eased after concessions by China on the trade deficit reduction and new rules on forced technology transfers. However, the economic conflict could intensify to export and investment controls, SOE and subsidy reform and structural reform. One of the potential flashpoints in future will be SOEs. It is no longer just about SOEs. The US also regards companies such as Huawei as state-controlled not because of ownership structure but because of the communist party’s involvement in key strategic decisions in addition to other unfair practices such as access to subsidies and forced technology transfers. This has implications for what is considered fair competition and mergers and acquisitions. However, Chinese authorities will never accept the US’s definitions and interpretations, raising the prospect of conflict. Another area of potential conflict is digital trade given competing visions of the flow and control of information and data. Lee made the point that the Donald Trump’s nationalistic “Make America Great Again” election campaign slogan is actually remarkably similar to the Chinese Communist Party’s vision of 中華民族偉大復興, which is roughly translated as “Great rejuvenation of the Chinese nation”. Lee concluded that in the short term we should expect rising costs and uncertainties and an economic slow-down, movement of supply chains, resources and talent, an increase in re-shoring and regional competition. On cross-Strait dynamics he expects a continuation of China’s dual strategy of aggressive political tactics towards the Taiwan government but an even softer approach toward Taiwanese business and people. The long term outcome is much more uncertain given a lack of clarity on the US’s intentions and end-game. Regardless, he expressed the view that Taiwan should focus on finding a new growth model.